I attended a workshop this past weekend led by Dean Ian Markham of Virginia Theological Seminary. Dean Markham had us plot out on a graph the characteristics of our own identity within our own denominational identity. The three axes of this graph were Roman Catholic, evangelical/reformed, and modernist/humanist. We began the exercise by plotting where we came from. And we explored our positions on authority (apostolic succession), sacraments, prayer to the saints, and whether other religious adherents are saved (and if they are, whether Jesus Christ was involved). Personally, I started the exercise fully over in the evangelical corner. I was raised in the Presbyterian Church (PCUSA). I was confirmed in the Episcopal Church on May 1, 2004. And once we started to talk about our beliefs now, as Anglicans, I expected to boldly step out of that quadrant for good. As we talked about authority I took a giant leap over to the Roman Catholic side of the room. I returned there (and found myself surrounded by my clergy peers) when we spoke about the sacraments. I'll save the other faiths question for another day. I'm not sure I'm at peace with the Roman Catholic view that Christ saves those in other faiths. I found myself more on the modernist side of that question. But what was a surprise to me is that when it came to prayer I was an evangelical. After saying this it may come as a real surprise when I tell you that I've started saying the Angelus (Hail Mary) as part of my daily prayer -- but I almost consider it experimental. But sure enough, there I am asking the Blessed Virgin Mary to pray for me "now and at the hour of [my] death". I'm not convinced of the efficacy of this prayer, but I recognize it as part of the church's heritage. And I want to experience it as a part of my praying the Daily Office with so many others. But I don't think about asking anything of Mary outside of praying the Angelus. Nor do I think about praying to any other saints as a matter of course. And I do believe that in prayer we have direct access to God through Jesus Christ. This, as I understand it, is a classic evangelical/reformed understanding of prayer. One version of this preface in the Eucharistic prayer even goes so far as to say "countless throngs of angels". Who are these angels? Are they saints too? What does it mean to pray with them? Is that the same as praying "through" them or asking them to pray for us? Because if I have little reason to pray to the saints, I have even less to pray to angels. And who can forget the terrible "angel fad" of the 1990s when you couldn't turn around without seeing kitschy angel stuff. Who are the angels anyway? They're messengers (the Greek root tells us). They bring messages from God. That prayer I mentioned above, the Angelus uses the words of the Archangel Gabriel when he appeared to Mary at the Annunciation. But – I wonder – did he carry Mary's message back to God? "Here am I, the servant of the Lord; let it be with me according to your word." (Luke 1:38). And we find the heritage of saints and angels not so much in our modern prayer book, but embedded in the church's song. I wonder if I have been avoiding them at my peril. If Mary is the greatest saint, she is not afforded the greatest angel: Michael. She was visited instead by Gabriel. He is "mighty" and the "herald of heaven". Michael is the "greatest angel". He is the "peacemaker blessed". Raphael "strengthens soul and body". A Sequence for St. Michael, words by Alcuin (735-804) and translated by Helen Jane Waddell (1889-1965) further illuminate these figures. To bring us the strength of God, and the lightning of His mercy. And give us to share in the joys of the blessed. The way Herbert Howells sets the word "Purge", might just be the most poignant note (a D-flat) in all of sacred music. His nine-year-old son Michael was suddenly stricken with polio one summer and died in a matter of days. Not even a quick trip to London and an iron lung could save him. How fully Howells must have known this deep, heart-throbbing imperative to God: "purge". And in times when there is no hope, no cure, we must alter the cry to "ease our pain". And Howells echoes the "purge" cry here, but it's less emphatic, less urgent. It's disappointed, but not without hope. There is always hope. Howells knew this too, as in his hymn MICHAEL "All my hope on God is founded". The cry of the church is that of human existence. We as the church continue pray for the sick, the bereaved, and the dead. I'm not sure how it all gets sorted out, but Howells has me thinking that the Angels hear our prayers too. I play a Rosales organ. Part of the fun of this is that I get to tell people a little bit about how unique (and how very good!) our organ is. It's one of two on the East Coast, I'll say. (The other one is in St. Bart's, Atlanta). Or I'll say, "Rosales also built the organ for Walt Disney Concert Hall in Los Angeles". When I mentioned Disney Hall recently, someone asked me, "does the organ get used there?" I'm happy to say that the answer is yes. And not only that, people what to hear it. Do you think organ music is still relevant today? There are always more people wanting to hear than can fit in the concert hall, so I think that's pretty telling. Ferguson, Dana. "Walt Disney Concert Hall's organ conservator pulls out all the stops". Los Angeles Times, 20 September 2013. Howells seriously loved him some Italian. And some of his expression and tempo markings are downright obscure. They commend themselves to study. We have previously on the blog defined the Italian terms used in the Howells Organ Sonata (1933). 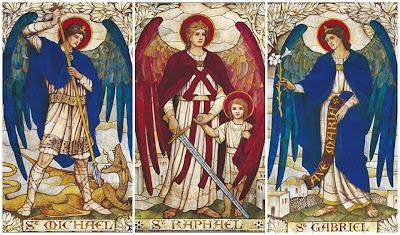 We turn our attention now to his choral masterpiece A Sequence for St. Michael. ardente - literally "burning". Vehement, fiery. con elazione - pride, haughtiness, arrogance. This is not a standard musical term. Interestingly, in the Organ Sonata Howells reaches for the word "Elato" to describe much the same thing. Meno attivo - less active. Sonoro - sonorous, with full tone. subdue - as in the final pedal marking "if appropriately subdue". I wish this were an Italian word in a macaronic registration instruction, but I'm 99% sure that the D of "subdued" just got left off.